The HFP’s Esper Sabrine was interviewed in El Pais on March 28, 2015, which can be found here, and in RBB online on March 26 2015 here. HFP’s Rene Teigeler was interviewed on Das Erste on March 29 2015, which can be found here. Franklin Lamb’s piece at Counterpunch also mentions the work of Heritage for Peace here. In the Old City, DGAM reports here and here of damage near the citadel, and to an area near Bab al Nasr here, and Qastal al Harami here from tunnel explosions. A newly released one-minute video shows an aerial view of Aleppo Citadel and its surroundings, shared by Aleppo Archaeology (March 24 2015) here. Damage assessment by video of the Tekyyet al-Rawi mosque in Deir Ez-Zor was shared by Protect Syrian Archaeology (March 17 2015) here. The DGAM reports damage to the famous Shaizar waterwheel here, including photographs. 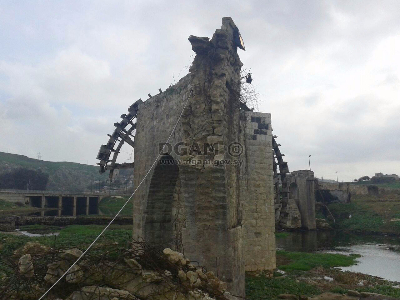 Shaizar castle, near Hama, has suffered severe damage, including the partial destruction of an inscription over the main entrance way. See the DGAM brief with photographs here. 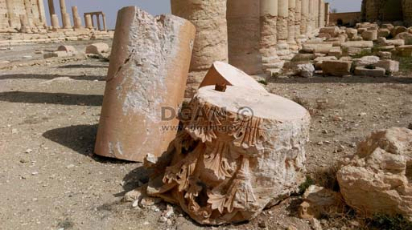 The DGAM reported (March 25 2015) new damage to the Palmyra necropolis. See vivid photos and the brief here. Photographs of damage to the Temple of Bel at Palmyra have been published by the DGAM (March 19 2015) here. A video report on the state of the Roman Theatre in Bosra, was shared by Protect Syrian Archaeology (March 26 2015) here. 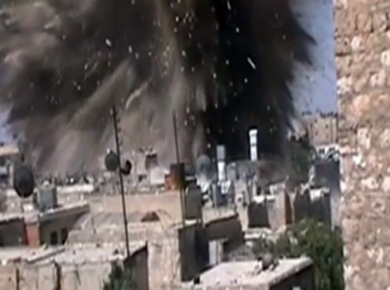 Video showing the targeting of Bosra site in Daraa with barrel bombs was shared by Protect Syrian Archaeology (24 March 2015) here. Severe fighting in Bosra has caused damage to the citadel, reports the DGAM on March 24 2015 here. Additionally, video shared by Protect Syrian Archaeology (March 22 2015) shows the targeting of a sniper position at the citadel here. The DGAM has posted new additional photographs of other sites around Bosra, including the Monastery of Bahira the monk, Mabrak Mosque, and Mosque of al Omari, which can be found here. Video shows the targeting of the Al Omary/ Al-Ummary Mosque mosque in Daraa, shared by Protect Syrian Archaeology (March 19 2015.) here. The DGAM reports (March 9 2015) that a number of artefacts have been ‘repatriated’ from the local community near Aleppo, and thanks them for their support. See the photos and brief here. Reuters reports on March 19 2015 that 120 stolen items from Palmyra have been recovered by Syria here. The DGAM reports (March 26 2015) that it is working with citizens in Bostra to protect the area around the Roman amphitheater here. The DGAM has formed a cooperation with Japan to safeguard cultural heritage as well. A March 15 meeting in Beirut discussed reconstruction, training, areas of mutual interest, and technical support. Details can be found here. The DGAM calls on the people of Idlib to protect the Idlib museum, after news that the city has been captured by anti-regime forces, here. See here for discussion of UNESCO’s Emergency Safeguarding of the Syrian Cultural Heritage Project and here for the project Rallying the International Community to Safeguard Syria’s Cultural Heritage. The Italian culture minister (20 March 2015) is calling for UN military intervention to safeguard cultural heritage sites in the Middle East. See an article from Deutsche Welle on it here. The AAAS has issued a ‘cautionary note’ about using satellite imagery to track cultural heritage destruction. Details can be found here. The European Association of Archaeologists has released a statement on the destruction of cultural heritage in the Middle East. A pdf of the statement can be found here. On April 9-10, The University of Pennsylvania Museum of Archaeology and Anthropology will be hosting a conference entitled “The Future of the Past: From Amphipolis to Mosul. New Approaches to Cultural Heritage Preservation in the Eastern Mediterranean”. Speakers included Katharyn Hanson on the use of satellite imagery to track destruction in Syria and Iraq. For details on the conference go here. Nuebauer Collegium for Culture and Society at the University of Chicago held a symposium on February 27 and 28 on “Archaeological Looting: Realities and Possibilities for New Policy Approaches”. See here for more details. In Slate Magazine Stephen Savage argues that ‘Satellite images don’t lie’ (March 31 2015) and the destruction caused by military activity is severe. Artnet reports that the National Museum in Damascus is putting over 300,000 objects into storage at ‘secret locations’ to protect them (March 30 2015). Eleanor Robson writes of ‘Modern war, ancient casualties’ in the TLS (March 25 2015). Counterpunch on March 24 2015 looks at the possibility US-Syrian Cultural Heritage Cooperation, and more laws and campaigns to protect it, here. Suddeutsche Zeitung discusses plundering in Iraq and Syria on March 17, 2015 here (in German). El Pais has an interview with UNESCO Director-General Bokova on 17 March 2015, which can be found here (in Spanish). Stony Brook Professor Elizabeth Stone was interviewed on CNN on March 16 2015 about looting and vandalism in Syria and Iraq by ISIS. See here. Rick St. Hilaire takes a look at Cultural Property Crime on UN Agenda, and how the upcoming conference will address heritage trafficking (March 16, 2015). The Times reports on March 14 2015 that looted antiquities are being posted for sale on eBay, which can be found here. The article has caused some controversy. See Sam Hardy on it here. The Lebanon News looks at Lebanese efforts to narrow the market for Syrian antiquities (March 14 2015). Franklin Lamb for Counterpunch on March 13 looks at how the iconoclastic activities of IS can be stopped and argues that ‘We can and must support new dedicated groups like Heritage for Peace and more than two dozen NGOs recently formed that are working to protect archaeological sites in Syria and Iraq.’ See the article here. Andrew Curry for National Geographic notes the sites of global importance victims of ‘appalling strategy of cultural cleansing‘ on March 12 2015. Conflict Antiquities asks who exactly is responsible for the looting at Dura Europos (March 12 2015) here. SRF Radio on March 10 2015 interviews archaeologist Mirko Novak about cultural destruction by IS here. NPR on March 10 2015 has an update about the use of satellite imagery to track destruction in Syria, focusing on Dura Europos, here. NPR on March 9 2015 runs a story about the efforts of Syrian archaeologists to protect their country’s heritage, which can be found here.